Please join us in congratulating the members of North High’s Academic Decathlon Team for their third place finish at this year’s Central Iowa Regional competition. 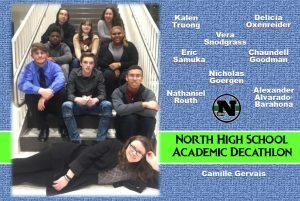 Team members include: Kalen Truong, Alexander Alvarado-Barahona, Nick Goergen, Camille Gervais, Vera Snodgrass, Delicia Oxenreider, Nathan Routh, Chaundell Goodman, and Eric Samuka. The team (once again) outscored all other DMPS schools and placed above everyone except Johnston and Dowling. Each of the students worked hard studying materials related to the 1960’s in multiple categories. Individual recognition was given to Camille Gervais for being the overall number 1 top scorer in her GPA division. Camille also received individual awards in art, music, science, social science, economics, and math. Nathan Routh was the overall silver medalist in his GPA division. He received individual awards for literature, science, art, economics, math, and speech. Chaundell Goodman received a 2nd place award for her performance in the interview category. We are very proud of North’s team and are looking forward to another awesome performance at the state competition in March.